Greenland may be just an island, but it is the largest non-continental island in the world and a country constituent to the Kingdom of Denmark. Basically, Greenland is a magnificent wilderness. You can go exploring without seeing anyone for miles. Of course, you need to be a bit adventurous to spend your vacation in Greenland. As for attractions, there are plenty. You can see the glaciers and the icebergs. The wildlife is impressive too with significant populations of whales, seals, walruses, and even polar bears. Lastly, while you can do ordinary activities like hiking g and mountain c climbing, we recommend that you try dog-sledding. You cannot do in too many places. Before you travel to Greenland, you need to check whether or not you need a visa. As mentioned above, Greenland is Dutch territory, but it is not in the Schengen Area. Even so, the island maintains an open border with the countries in the Schengen Area, so neither of its citizens requires a visa. All the other nationalities must submit a visa application at the nearest diplomatic mission of Denmark. One aspect that is worth mentioning is that the citizens of the Nordic countries do not need a passport to access Greenland and neither the citizens of the European Union and European Economic Area countries. If you want to find out whether or not you need a visa, you should use iVisa’s Visa Checker. It is fast and convenient. All you have to do is click on the Visa Checker button you see in the top right corner and fill in the boxes. You must select your nationality from the drag-down menu on the left, and on the right, you must choose Greenland as your destination. The result will tell you if you need a visa or not, and if you do, you will be given some useful information such as a list of the nearest embassies where you can apply. 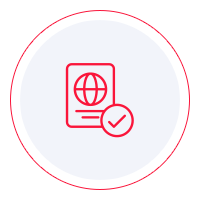 Unfortunately, iVisa does not process applications if you want to get a visa for Greenland. At the moment, that is not possible. However, if you need information related to your visa application process, you can contact us 24/7. The service is free of charge. At the same time, what you must learn is the requirements you need to meet before departure or the application process. You can find a lot of information online, but we advise you to use it as a reference only. The info you see online is not always the most reliable. Consequently, we recommend that you call the diplomatic mission of Denmark and ask your questions there. They can give you the most legitimate answers. Meanwhile, what we can tell you is that travelers who take a trip to Greenland need to have a passport that does not expire for at least another 6 months from the date of arrival. However, the citizens of EU and EEA countries can access the islands with their National ID Card. We are sorry that we cannot help you any further with the visa application process, but we hope that the information above is of some assistance.